My son plays for the Blue Jays in the High Park tee-ball league. They won their quarter-final game on Friday, their semi-final game on Saturday and split the first two games of their best-of-three final series against the Mariners on Sunday. Game three took place last night, and it was ridiculously close. It ended in a tie, as you'll see in this excellent Tee-Ball Tuesday coverage by Kathryn Humphries and the gang at City-TV. If the video above won't play for ya, click here. Because game three ended in a tie, game four was played tonight. If you're keeping track, that's six games in five nights for these kids. I'm exhausted just watching. Alas, it wasn't to be. 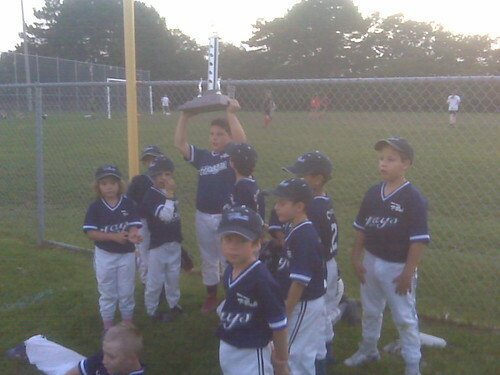 James and his Jays lost a close one but ended up with the world's largest second place trophy. I love watching T-Ball Tuesday on Wednesday. It's laugh out loud. But I couldn't help but notice a couple of the kids really look like they should have graduated from the t-ball and been in the next league up. Seemed a little unfair at times. I think you had to be 8 or under when the season began. So if you turned 9 in July, you could play tee-ball.